Allure Homme Édition Blanche (Eau de Toilette Concentrée) is a popular perfume by Chanel for men and was released in 2008. The scent is citrusy-fresh. The production was apparently discontinued. My new favorite summer citrus. Edition Blanche is such a gorgeous creamy lemon! This is my new favorite of all the citrus based fragrances, and i particularly prefer it over DHS, which i find a bit too sharp and fizzy. The slight powderiness makes it feel so refined and comforting, even empowering I would say. I tested both EDTC and EDP before buying it and they perform identical on my skin. Performance wise, projection is marvellous in the first 2 hours, but afterwards it quickly becomes a skin scent and I can barely feel it, even on clothes. After 6 hours it's completely gone. This is pretty much the biggest minus, considering that it's an EDP and Chanel charges about 10 GBP extra, compared to EDTC. Smells exactly like a lemon pie (with a touch of pepper)! Actually this scent has almost nothing to do with others from Allure line. This is a sweet yet comforting vanilla/lemon scent. Opens with a nice pepper note, then joins lemon (here it remembers me of Habit Rouge for a little while) and finally a vanilla/amber base. Quiet but potent, lasting power is around 8 hours while sillage and projection are discret. Definetely thumbs up! Allure Homme is by far one of my favourite scents on a man, so it made perfect sense to see what it's many versions were like. 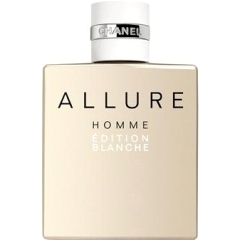 Allure Homme Edition Blanche, may not have all the rich woodsiness that made Allure Homme so appealing, but this fragrance is a nice alternative for casual wear and warm days. This fragrance opens with subtle lemon, delicate vanilla creaminess and a dash of pepper. It's quite smooth and soothing. I particularly like how clean it smells on a man. My boy tried on the aftershave version of this fragrance in the store and I really enjoyed its refreshing subtlety. He wasn't so keen on the fragrance unfortunately, mostly because he's a smoker and lighter scents are much harder for him to smell. I must admit that at times, this fragrance was even hard for me to detect. The lasting power is pretty good, in both the EDT and Aftershave concentrations, and like I mentioned before, the sillage is fairly intimate. The drydown is quite possibly my favourite aspect of this fragrance, which is a creamy sandalwood, musk and vanilla blend. In some ways I find this fragrance quite milky, a little similar to Emporio Armani White for Men. Despite its creamy approach and the rather delcious vanilla accord, this fragrance is very masculine, so don't let the notes fool you into dismissing it. I need to get this on my collection. The best Chanel from the non Exclusives line.